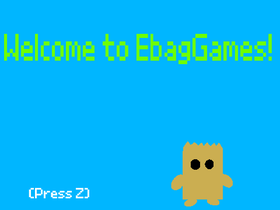 I'm Ebag Games i make random games for no reason! If you remix my project please change at least 2 things or i will report you! If you add one of my games to a studio please ask me first! if not i will ask you to remove it if you don't reply or remove it first i will report you to the Scratch Team!